Fusion, soul jazz, jazz funk, call it what you will, the commercial end of improvisational music has made a big comeback recently. And leading the way in US Christendom are ALLEN & ALLEN. Mike Rimmer writes. Zowie! Some days you hear an album that's so good you want to tell the world. Such was the case with 'Come Sunday' by keyboardist Bruce Allen and saxophonist Allen Wiggins now released in the UK via Word. I set out to speak to Christendom's acclaimed inspirational jazz duo. Saxophonist Allen Wiggins is a bit of a boffin. Having gained a degree in pharmacy, he was, until recently, a practising pharmacist but now he's swapped the potions and pills for pastoring with his father in Orlando. He describes himself as "super busy" and I almost feel guilty taking up 20 minutes of his precious time. His church has three services and he preaches at two of them. This Sunday night he's involved in a benefit programme in Memphis then he's travelling to Colorado doing concerts. Oh yeah! He's just come back from Germany. Wiggins' musical partner Bruce Allen first learnt the piano as a bet. Well, not quite. "I guess it wasn't so much a bet as a challenge," he corrects me. "In the church where I grew up in Illinois, Pastor Moore got up into the pulpit one Sunday morning and offered a 50 dollar bond to the first person who learned to play piano or organ. To me, at eight years old, it sounded like a whole lot of money! I told my parents I was going to win those 50 dollars." A date was set and Allen played for the church and won the money. "That was my humble beginning on my career in music," he laughs. And what about the money? "As far as the money goes, I didn't even allow the bond to mature! It burned a hole in my pocket." Again he laughs, "I was so anxious to spend that money!" After Bruce Allen finished studying music at college (where Dionne Warwick once visited and encouraged him, fact fans!) he became the full time music minister in his church in Jacksonville. Although he'd met Wiggins briefly at college, the two only hooked up when the sax player performed a concert at Allen's church. Allen became musical director for Wiggins and eventually that led to Allen & Allen. The vision of the duo is to mix jazz and gospel together into what they call inspirational jazz. Wiggins fills me in on the details, "Our music is inspired by God. We happen to be jazz lovers who use jazz as a vehicle to bring forth the gospel that God has given us. We believe it's the heart posture of the individual that makes the difference. It's one thing to play a note; it's another thing to play an anointed note. God has given us an anointing on our notes, so we are able to go out and destroy yokes. All of our music is inspired by God. In the Bible, David is known for his playing. When the king sent for him, he'd heard about him playing in the fields. David came and played an evil spirit out of Saul." So what-sort of spiritual experiences does Wiggins have while playing the saxophone? "I've definitely had a spirit of healing on me and of giving joy. I was invited to play at a funeral. It was so depressing and everyone was in mourning. God allowed me to play a song and before I knew it, the people were laughing and clapping! Because of the instruments we play, we're really able to express ourselves and open up to the move of God which has an anointing that comes forth and destroys yokes." Allen Wiggins continues to explain about the spiritual aspect of the duo's music. "It's about destroying strongholds, beliefs and doctrines. A yoke was a thing that would go round a cow's neck and it would keep it in line so that it couldn't move freely. The anointing comes in, breaks that yoke and allows the person to move freely and become envisioned so that they can see and hear the Word of God. We do a song on 'Come Sunday' called 'Tears Of Joy'. It doesn't have any words at all but it's one of our strongest songs in concert because a person can sit there and listen to the melody and insert their situation into that melody. God speaks through us, being the vehicle, to the individual and causes that person to feel a special anointing or calling on their life. Recently we were in Austin, Texas and extended an invitation for discipleship and several souls got saved that night as a result of the ministry in the music." 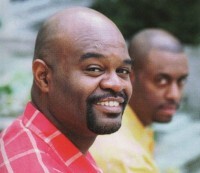 By powerfully combining elements of gospel and jazz, Allen & Allen are attempting to create a new anointed music form. Wherever there are pioneers, there's a good chance that there will be opposition. The Church has traditionally been very suspicious of jazz music. Allen Wiggins remembers that it was sometimes difficult when he first started. "In the traditional Baptist church at the time, you could barely get drums in the church much less a saxophone. But my dad was the pastor and he believed that everything that has breath should praise the Lord!" Attitudes have changed over the years and Wiggins continues, "This is our fourth project and we've been at it for five years now. At first the Church was very apprehensive about it and would raise an eyebrow if you mentioned playing inspirational jazz. When you think of gospel you think of tambourines, piano and organ. But when you think of jazz, you think of the laid back, the cigarette and the wine glass. But we took all of those negative connotations out of jazz and put a positive one it. Man is the one who's changed the meaning of music; it's the Devil who perverted everything that God's given us. Everything God made was good. When people started feeling ' the anointing in our concerts, they knew it had to be of God." Bruce Allen takes up the theme and gives a biblical perspective, "It's really simple when you understand the biblical history of music. I didn't understand it initially, but later on in life I began to study it. I noticed the gift God had given me. The Church was telling me one thing but I was feeling something else. Growing up in a Pentecostal church, they were saying that my style of playing was not palatable for the worship experience. I couldn't see it because I had all this music in me and had disciplined myself to try and increase my skill. I didn't just sit in the gift God gave me, as the parable of the talents goes. I was the man who wanted to increase his talent so I gleaned from everybody that I could. My parents didn't want me to be in a jazz band because they thought it was the Devil's music! Once I became an adult and started studying the Scriptures myself, I came to understand that God is the Creator. The devil is a thief who has come to kill and destroy. So if he stole it, the Bible says that the gates of hell shall not prevail against the Church. That means that I have the permission to go onto his territory and take everything that he's stolen from God. Now I understand why God made me so radical - it's because he was trying to make a change." 'Come Sunday' is the first of Allen & Allen's four albums to be released in this country and shows a duo at the height of its powers mixing beautiful instrumental passages with some harder hitting music taking in rap, R&B and funky influences as well as the gospel and jazz. They've also enlisted some top class help whether it's the legendary Albertina Walker contributing vocals on a wonderful big band jazz gospel arrangement of "You Don't Know What The Lord Had Done For Me" or the title track which is an arrangement of a Duke Ellington song featuring gospel star Darryl Coley. For "Come Sunday", they invited Coley to sing lead because he was one of the Allen's favourite singers. In truth the arrangement had such a wide range (it changes keys about five times!) they couldn't think of anyone else who could sing it! Wiggins tells of the invitation, "We'd rubbed shoulders and hit it off really well. We gave Darryl a call and he considered doing it. We flew up to North Carolina to record it because he was doing a play, so we dragged him into the studio afterwards and had him sing." The outcome, like every song on the album, is a classy affair! 'Come Sunday' is definitely something special and if you love gospel or jazz or simply enjoy music that can touch you deep inside, you need to check Allen & Allen out. They're pioneering some powerful music.